Terms and Conditions Apply - See www.suzuki.com.au/testdrivepromotion for full terms. Open to Australian residents over the age of 18. One entry per Eligible Product Purchase, defined in full terms. Competition opens 13/4/19 at 12:00 AM and closes 13/4/19 at 11:59 PM. Winner drawn 3/5/19 at 10:00 AM at Permitz Group, Suite 2.03, 4 Ilya Avenue Erina NSW 2250. The total prize pool valued at up to $18,620 (incl. GST). Winner notified by phone and email and published at www.facebook.com/suzukiaustralia from 6/5/19 for 28 days. 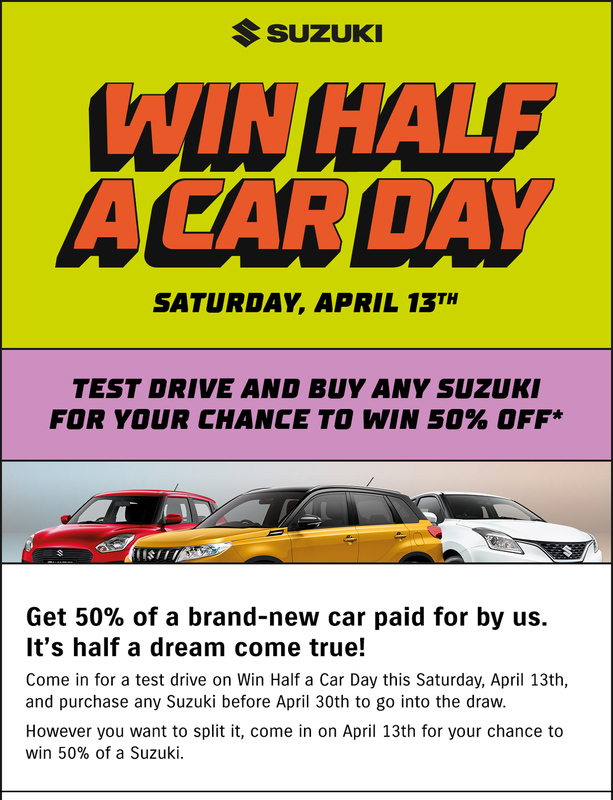 The Promoter is Suzuki Australia Pty Ltd (ABN 57 001 828 164) of 97-105 Cherry Lane, Laverton North, VIC 3026. Authorised Under: NSW Permit No. LTPS/19/33451, ACT Permit No. TP 19/03058. SA Licence No. T19/505.